Russell Carrington Wilson, professionally named as Russell Wilson is an American football quarterback for the Seattle Seahawks of the National Football League (NFL). Previously, he played college football at the University of Wisconsin during the 2011 season. The Seahawks selected him as the 12th pick in the third round of the 2012 NFL Draft. What is Russell Wilson Famous for? An American football quarterback for the Seattle Seahawks of the National Football League (NFL). Russell Wilson was enjoying a date night this weekend while analysts, reporters, and fans were glued to their computers waiting to find out whether or not the star quarterback would agree to terms on a new deal with the Seattle Seahawks before his imposed deadline of April 15. Even NFL players took to social media to express their thoughts on Wilson’s contract situation. His tweet came in the form a reply to a story written by Pro Football Talk, questioning Wilson’s desire to play elsewhere, namely, with the Giants. Florio only cites a “league source” and neither Wilson nor his camp has suggested he intends to play anywhere else besides Seattle. Wilson appeared on the “Tonight Show” with Jimmy Fallon mid-March following his appearance at Yankees spring training and was asked about a possible connection with the Giants. Wilson and the Seahawks have less than 24 hours to agree to new terms, so we just might have an answer to that question shortly, after all. So, stay tuned with us, for more update. Where is Russell Wilson born? 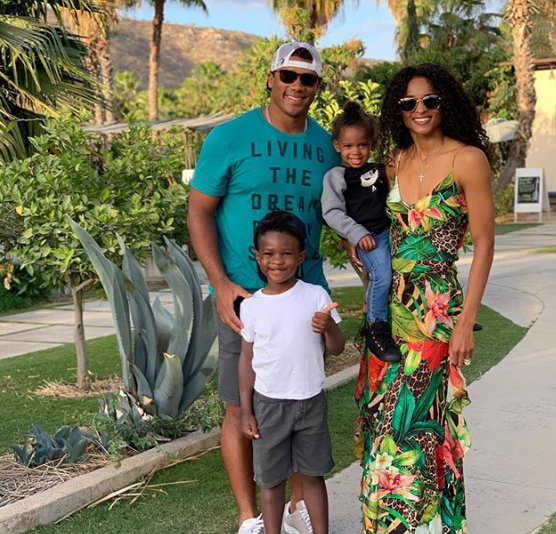 Turning back to his early life, Russell Wilson was born in Cincinnati, as the son of Harrison Benjamin Wilson III, a lawyer, and Tammy Wilson (née Turner), a legal nurse consultant. Throughout his childhood years, he grew up in Richmond, Virginia. Additionally, he has an older brother, Harrison IV, and a younger sister, Anna. He became interested in the world of football since his early life. He is of American nationality. Furthermore, he belongs to a mixed ethnic background of African-American and Native American. Talking about his education, Wilson attended Collegiate School, a preparatory school in Richmond, Virginia. As a junior in 2005, he threw for 3,287 yards and 40 touchdowns. Similarly, as a senior, he threw for 3,009 yards, 34 touchdowns, and seven interceptions. When did Russell Wilson pursue his football career? Russell Wilson got enrolled at the North Carolina State University in 2006, despite earning a scholarship from the much coveted Duke University. Playing for NC State, Wilson became the very first freshman quarterback to secure all-ACC first team honors. However, what caused trouble for Wilson was his desire to play baseball, which enraged Coach Tom O’Brien. In 2010, Colorado Rockies drafted Russell for the Major League Baseball. Seeing the situation getting out of hand with his previous coach and team, Russell made a transfer to the University of Wisconsin for his final year of college. It turned out to be a great senior year for Wilson, as he led his team to win the Big 10 conference title. He also managed to set a new NCAA record owing to his passing skills. Even then, he was considered not fit for NFL due to his smaller frame but somehow Seattle Seahawks signed him on for the 2012 NFL draft. In May 2012, Seahawks signed Russell on a four-year contract and he played his first pre-season match against Kansas City Chefs. In September that year, Russell got to make his regular season debut in a loss against Arizona Cardinals. Russell eventually caught up with the vibe and his game kept improving one game at a time and in the week 10, he was honored as ‘Pepsi Rookie of the Week’. The regular season ended with Wilson reaching the 4th rank in the NFL passers. By the end of the season, the NFL’s performance-based pay program awarded him USD 222,000 for his impactful performance in his debut season. Wilson ended the 2013 Super Bowl Season with a magnificent personal score of 26 touchdown passes and 9 interceptions. By the 13th week, he had already been honored with ‘NFC Offensive Player of the Week’ award for the second time in his career. Upon defeating the San Francisco 49ers in the NFC championship match, Seahawks ensured their entry into the Super Bowl XLVII. Wilson performed magnificently and earned a cash bonus of USD 169,141 through the league’s Performance-Based Programme. 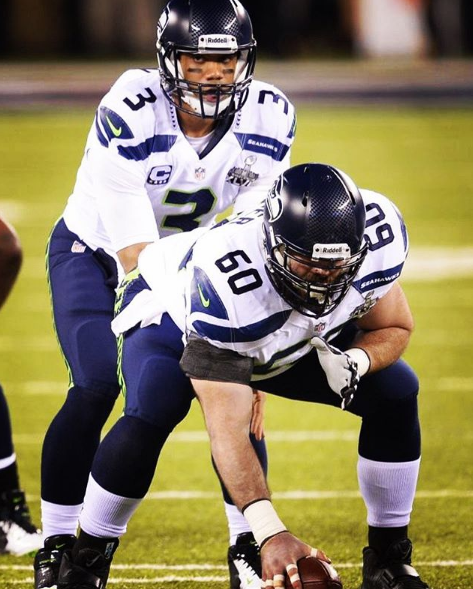 In July 2015, Wilson’s contract was extended for 4 years with the Seahawks. Wilson’s performance wasn’t up to the mark for the first few games but he caught up with his best performance and set the record as the only quarterback in the history of NFL to throw 3+ touchdown games without any interceptions in 5 consecutive games. Wilson eventually broke many single records that season, including most passing yards, highest passer rating and most passing touchdowns. Russell, during all these times, was constantly considered as one of the best quarterbacks the team ever had, despite his overall performance lacking punch. Wilson finished the year with the highest passer NFL rating and in the pro bowl draft later that year he got drafted as first overall in the 2016 pro-bowl draft by Team Irvin adding one more honor to his name in the game, the Pro Bowl Offensive MVP. In the 2016 season, Wilson was mostly injured, yet he played in all the 16 games, leading his team to an NFC west win. Seahawks got defeated out of the tournament in the divisional round by Atlanta Falcons, but Wilson’s performance was appreciated. Russell Wilson also happens to be the face of many coveted brands such as Microsoft, Alaska Airlines, Duracell, Bose, Pepsi, and Nike. In 2014, Wilson co-owned a European bread company named ‘Eat the Ball’ and launched his very own clothing line ‘Good Man Brand’. 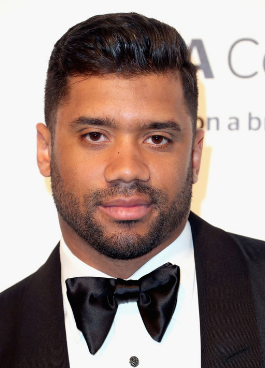 Who is Russell Wilson married to? 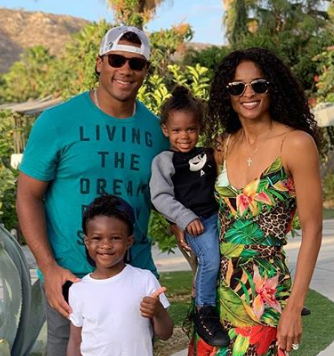 Reflecting his personal life, Russell Wilson is a married man. He began dating American R&B singer Ciara in early 2015 and announced their engagement on March 11, 2016. The pair married on July 6, 2016, at the Peckforton Castle in Cheshire, England. Furthermore, their daughter, Sienna Princess Wilson, was born on April 28, 2017. Before marrying Russell, Ciara was once married to ace rapper, Future and they have a son named Future Zahir together. Moreso, after the marriage, Future Jnr. has legally become Russell’s stepson. Previously, Wilson met his first wife, Ashton Meem, while they were both high school students. They married in January 2012 and divorced in April 2014. Further, He had also dated Samantha Hoopes in 2015. How much is Russell Wilson net worth? As a professional footballer, He must be accumulated a lot of money from his profession. According to celebrity net worth, his estimated net worth somewhere around $45 million and salary around $12.5 million. Similarly, Wilson earns $6,500,000 from the endorsement deals. Talking about his assets, He owns seven bedroom house in Bellevue, Washington which worth $6,700,000. He received $87,600,000 from the contract with Seattle Seahawks. He endorsed many coveted brands such as Microsoft, Alaska Airlines, Duracell, Bose, Pepsi, and Nike. Russell co-owned a European brand company ‘Eat the Ball’ in 2014 and also launched a clothing line ‘Good Man Brand’. Observing his body statistics, He has an athletic body build with a height of 5 feet 11 inches and weighs around 94 Kg. Similarly, he has a pair of dark brown eyes and black hair color. Further, his body measures 48-37-16 inches including chest, waist and biceps sizes. Selected by the Seattle Seahawks in the 3rd round of the 2012 NFL Draft (75th overall selection). Apart from football, Wilson played basketball and baseball for his collegiate school. During his senior years, he also served as his class president. On June 9, 2010, Wilson's father died, after a lengthy battle with diabetes. Wilson believed that his father along with the Lord was guiding me.